WHAT ARE THE BEST ONLINE MASTER'S IN CIVIL ENGINEERING PROGRAMS? What Else Can I Expect From an Online Master's in Civil Engineering Program? Earning an advanced degree in civil engineering can broaden your career opportunities and help you earn a higher salary. On this page, you'll find a collection of the best online civil engineering master's degrees, as well as information about how to choose the right one. Graduates with advanced degrees in civil engineering can expect increased job demand and compensation, as the U.S. faces the task of replacing and modernizing the country's aging infrastructure, which includes bridges, roads, airports, and water systems. According to the Bureau of Labor Statistics, civil engineers earn a median salary of $83,540 per year, and the field is projected to grow. The University of Florida's Department of Civil and Coastal Engineering offers an online civil engineering master’s degree through its Electronic Delivery of Gator Engineering (EDGE) platform. The department’s research program is focused on engineering for the public good and making a difference. Students enrolled in the 30-credit master of science in civil engineering program have the option to complete a thesis or a non-thesis project. Each student’s program is designed individually with the help of a faculty adviser and must be approved by the department chair. Courses include foundation design, geosensing I and II, behavior of steel structures, and design of temporary structures. Online learners choose from nine specializations, including public works, sustainable construction engineering, and coastal ecosystem dynamics. To graduate, students must maintain a cumulative 3.0 GPA. Tuition is more expensive for distance learners who are not Florida residents. Columbia University in the City of New York offers a master’s degree in civil engineering online through its Department of Civil Engineering and Engineering Mechanics. The 30-credit master of science in civil engineering degree is available completely online, with no in-person requirements. Students take six core courses in subjects like finite element analysis, advanced heat transfer, and geotechnical earthquake engineering. Learners must take at least four elective courses, which allow them to explore theories and concepts not covered in the core. The flexible program offers numerous concentrations, including hydrogeology, experimental mechanics, acoustics, and earthquake engineering. Students can create concentrations by combining them, resulting in concentrations like experimental mechanics of hydrogeology. Applicants need a minimum 3.0 GPA, a bachelor’s degree in civil engineering or a related field, and GRE scores. Students must complete the program within five years of the start date. The online civil engineering master’s degree at North Carolina State University is designed for students who hold an undergraduate degree in engineering. The program is delivered by the Engineering Online Department, which offers 16 online graduate degrees. Available concentrations include water resources, transportation systems, and geotechnical. At the beginning of the program, students create an individual plan of graduate work with the assistance of an academic adviser. The 30-credit master of civil engineering degree does not require a thesis and is offered completely online, with no on-campus residency requirements. Students must complete the degree within six years of the start date. Applicants must have a bachelor’s in civil engineering from a regionally accredited institution and a minimum 3.0 GPA. The GRE is automatically waived for all U.S. applicants who hold an engineering degree from an American college or university. University of Virginia offers a master’s degree in civil engineering online that is available through the extended graduate education program. The Civil and Environmental Engineering Department offers the 30-credit, five-year master of engineering degree, which emphasizes infrastructure systems. Three tracks are available: transportation engineering, pavement engineering, and structural engineering and solid mechanics. Students must complete 10 courses, and at least five must be taken through UVA; up to five courses may be taken through other graduate engineering programs at area schools that UVA has agreements with, such as Virginia Tech, Old Dominion, and Virginia Commonwealth University. This allows students to create a unique, individualized curriculum. Courses include green engineering and sustainability, traffic operations, and computational methods in civil engineering. Students complete assessments in engineering analysis, engineering design, and engineering technical writing. To graduate, students must maintain a cumulative 3.0 GPA. Distance learners can pursue a master’s in civil engineering online at the University of Washington. The 42-credit program is designed for working professionals looking to advance their career in the construction engineering field and is available completely online, with no in-person requirements. UW’s master of science in civil engineering: construction engineering takes two to three years to complete for part-time students. Learners must complete 14 courses and can take up to four credits each quarter and in any sequence. Classes include cost analysis and management, accounting and finance for construction, and heavy construction estimating. Courses combine management techniques with engineering principles. Applicants need a bachelor’s degree in engineering from a regionally accredited college or university and a minimum 3.0 GPA for the last 60 semester credits or 90 quarter credits. Students can begin the program any quarter. Residents and non-residents of Washington state pay the same tuition. The University of Illinois at Urbana-Champaign offers a civil engineering master’s online through its Department of Civil and Environmental Engineering. The 36-credit, non-thesis master of science in civil engineering is designed for practicing professional engineers and can be completed entirely online, with no in-person requirements. Students choose from one of the following specialty areas: construction management, infrastructure, transportation engineering, or structural engineering. Courses are available in the following concentrations, which are intended to complement the student’s specialty area: construction materials, environmental engineering and science, environmental hydrology and hydraulic engineering, geotechnical engineering, and structural engineering. Distance learners receive the same lectures and curriculum as on-campus students. Students in the civil engineering program take classes like air quality engineering, traffic capacity analysis, and nonlinear analysis of steel structures. Students must finish the program within five years of the start date. The master’s in civil engineering online at Case Western Reserve University in Cleveland prepares students to take on leadership roles in the fields of civil and environmental engineering. Graduates serve in a variety of capacities, including research, teaching, and professional practice. Online civil engineering students are eligible to apply for two different Case School of Engineering scholarships. Tuition for the master of science in civil engineering program is the same for all students, regardless of residency status. The 27-credit degree requires students to complete nine courses, and students can declare a concentration in structural issues. Case Western’s online engineering program accepts students on a rolling basis, with three start dates each year. Applicants must have a bachelor’s degree in engineering or be able to demonstrate proficiency in calculus and differential equations for admission. Colorado State University-Fort Collins offers a civil engineering master’s online that focuses on global water resource issues and management. Online engineering faculty have experience in hydrology, environmental statistics, and utility management. Online students can earn a master of engineering with a focus in water resources engineering or a master of science in civil engineering with a focus in water resources. The 30-credit, coursework-only degree option does not require a final project or exam. Students earning the MS must complete 32 credits, which includes a final project paper and a final examination that must be taken on campus. The ME is designed for working engineers who want to pursue more advanced study in a specialized area. Courses include advanced biological wastewater processing, urban stormwater management, and GIS in civil and environmental engineering. An undergraduate degree in engineering is not required for admission to the program, however, applicants without an engineering undergraduate degree must complete some prerequisite courses prior to admission. The 30-credit master’s in civil engineering online at the University of Tennessee offer a thesis and non-thesis option. The thesis track includes 24 credit hours of coursework and six credit hours of thesis work. The non-thesis option is a coursework-only program, which may include a three-credit, special-problems course that's completed with the supervision of the student’s adviser. Online students in the master of science in civil engineering program can choose between two concentrations: public works or transportation. Transportation concentration courses include sustainable transportation, transportation safety, and intelligent transportation systems. Courses available in the public works concentration include construction engineering, environmental engineering, and transportation engineering. Applicants must have a minimum 3.0 GPA and an undergraduate degree in engineering. Prospective students with a bachelor’s in an engineering field other than civil engineering or a bachelor’s in a non-engineering field may need to complete prerequisite work for admission. Norwich University, located in Northfield, Vermont, offers a civil engineering master’s online degree. The program’s focuses on improving infrastructure and the built environment in the U.S., and the curriculum combines technical knowledge with in-demand management skills. The master of civil engineering program is designed for working professionals in engineering or engineering-related fields, and coursework can be completed in 18 months. Students usually graduate within 21 months from their enrollment date. The 36-credit degree consists of six, six-credit core classes that last 11 weeks each. Students personalize their studies by choosing one of four different technical tracks: structural engineering, environmental/water resources engineering, geotechnical engineering, or construction management. At the end of the program, students present a portfolio of their work to faculty members during a required residency week in June; the rest of the degree can be completed entirely online. Distance learners benefit from classes capped at 15 participants, which allows for in-depth classroom discussions with peers and professors. The master’s in civil engineering online at the University of Louisville in Kentucky is designed exclusively for working professionals who hold a bachelor’s degree in civil engineering. Full-time faculty who teach at the J.B. Speed School of Engineering at the Louisville campus deliver the curriculum for the online master of science in civil engineering. The completely online program consists of 30 credit hours, which can be completed in three intensive-enrollment semesters. The core requirement is 18 credits, and the rest are electives. Courses available include timber design, geometric highway design, entrepreneurship in CEE, and environmental analysis of transportation systems. When distance learners begin the program, a dedicated adviser is assigned to them who provides assistance throughout their enrollment. Students can transfer up to six credits of graduate coursework from another regionally accredited college or university. All applicants must take the GRE. Kansas State University, located in Manhattan, offers an online master’s in civil engineering through its Global Campus and Department of Civil Engineering. The 30-credit program is designed for professional working engineers who already hold a bachelor’s degree in civil engineering. All coursework for the master of science in civil engineering can be completed online, although students must travel to campus at the end of their program to complete an oral examination. Tuition is the same for all students, regardless of residency. Fall and spring semesters last 16 weeks; summer classes last 8-12 weeks. Students pick from five different focus areas: transportation, environmental, structural, geotechnical, and water resources. Unlike other master’s in civil engineering programs, Kansas State does not require students to complete a group of core courses. Instead, learners work with their academic adviser to design an individualized curriculum related to their focus area. Distance learners can pursue a civil engineering master’s online through Auburn University, a public research university in Auburn, Alabama. The master of civil engineering degree requires applicants to hold a bachelor’s in civil engineering or a closely related field and have formal engineering training. Students can transfer up to six credits from another college or university with the approval of their advisory committee. At the start of the program, students develop an individualized curriculum that allows them to focus on a sub-specialty of interest. Distance learners take civil engineering courses like chemical principles of environmental engineering, air pollution, and project estimating. Students must complete 30 credits of coursework, which may include a three-credit civil engineering project. Students are allowed to take courses in related fields outside of the Department of Civil Engineering as part of their required 30 credit hours. The University of Texas at Arlington offers an online master’s degree in civil engineering. Online students pursuing the master of science in civil engineering degree work with a faculty adviser to design a curriculum in a technical area of engineering, such as transportation, water resources, and geotechnical issues. The 30-credit program consists of 24 credits of coursework and six thesis credits. Additional graduation requirements include a minimum 3.0 GPA and completion of core course exams with a minimum 75% grade. UT Arlington’s master’s in civil engineering program requires applicants to have a bachelor’s degree in civil engineering, a minimum 3.0 GPA, and a GRE score of 700 (old score system) or 155 (new score system). The GRE may be waived for applicants who graduated from UT Arlington within the last three years with a civil engineering or closely related degree and who have a minimum 3.0 GPA. Clarkson University in Potsdam, New York, offers an online master’s in civil engineering through its Department of Civil and Environmental Engineering. The department focuses on sustainability and environmental health. The master of science in civil and environmental engineering requires that 20 credits of the mandatory 30 be completed in residence in Potsdam. Students choose between four specialty areas: environmental, geotechnical, structural, or water resources engineering. Courses include computational fluid dynamics, transportation systems design, and theory of elasticity. All students must complete a six-credit thesis and defend it in front of three faculty members. The program accepts a maximum of 10 transfer credits. Learners must complete the degree within four years of their start date. Exceptional students in the master’s program may be invited to proceed directly to Clarkson’s civil engineering PhD program. Applicants must hold a bachelor’s degree in civil and environmental engineering or another engineering discipline. The GRE may be waived for some applicants. The online master’s degree in civil engineering program from Mississippi State University’s Department of Civil and Environmental Engineering offers the following concentrations: structures, geotechnical, water resources, transportation, construction materials, and environmental engineering. MSU started delivering distance engineering courses in the 1980s. Online courses include recorded lectures that are available 24/7 in a digital repository. Students in MSU’s master of science in civil engineering program are not required to complete a thesis, but the option is available. Thesis students complete 30 credits; non-thesis learners must take 33 credit hours to graduate. Courses include soil mechanics, open channel hydraulics, and stream reconnaissance. Applicants must hold a bachelor’s degree in civil engineering from an ABET-accredited program, a minimum 3.0 GPA, GRE scores (in most cases), and be accepted by a faculty member in their sub-discipline area. The University of Texas at Tyler offers a four-year online master’s degree in civil engineering. The entire master of science in civil engineering degree can be completed online, with no in-person requirements. Students choose from three different tracks: research, professional practice, or technical and management development. The research track requires learners to prepare a research thesis, as well as additional coursework and exams. Students pursuing the professional practice track complete a capstone project and focus on professional practice in their coursework. The technical and management development track includes additional coursework that teaches management skills. Applicants should have an engineering background equivalent to that of students graduating from the school's bachelor’s degree in civil engineering program or be willing to complete prerequisite courses. Prospective students must also have satisfactory scores on the GRE or three years of engineering experience, a satisfactory GPA, and approval from the chair of the Department of Civil and Environmental Engineering. Online students at the University of Idaho in Moscow can pursue a master of engineering in civil engineering. The online master’s in civil engineering is a non-thesis degree that requires students to complete 33 credit hours and a technical paper to graduate. Online learners select from five areas of emphasis: environmental and sanitary engineering, geotechnical engineering, hydraulics and water resources engineering, structural engineering and structural mechanics, and transportation engineering. Interested students can apply for interdisciplinary curriculums, such as a specialization in soil mechanics that involves study in geology or mining engineering. Prefered applicants have a bachelor’s degree in civil or environmental engineering. Applicants with undergraduate degrees in other fields are eligible to apply but must demonstrate completion of undergraduate work in math through differential equations and one semester each of chemistry, physics, and engineering statics. Accepted students without a bachelor’s in engineering will also be required to complete prerequisite work upon admission. Lawrence Technological University is a private school in Southfield, Michigan, that offers an online master’s degree in civil engineering. The master of science in civil engineering is offered completely online and takes two years to complete. Class size is limited to 25 students to encourage engagement and active participation. The program includes a specialized structural engineering focus that explores structural dynamics, advanced steel design, and the use of composite materials in buildings. LTU’s civil engineering master’s program is designed for professionals from diverse backgrounds, including engineering, project management, manufacturing, and other technical fields. Students choose from a 30 credit thesis option or a 33 credit non-thesis option. Courses include structural masonry design, sustainable construction practices, bridge design, and structural dynamics. Applicants must provide proof of a bachelor’s degree in civil engineering (or equivalent) from an ABET accredited program, have a minimum 3.0 GPA, three letters of recommendation, and a professional resume. Ohio University, located in Athens, offers an online master’s in civil engineering that can be completed in five semesters. The program is offered completely online with no on-campus or residency requirements. The curriculum focuses on using advanced techniques and principles of mathematics and science to address issues related to building infrastructure. Students complete 10 credits of core courses, including a one-credit seminar. The master of science in civil engineering lets students choose one of the following emphases: construction engineering and management, environmental engineering, structural engineering, or transportation engineering. The specialty curriculum includes courses like construction planning and scheduling, prestressed concrete design, traffic impact studies, and chemical fate and transport. Students learn how to plan, design, supervise, and build infrastructures from a faculty of experienced civil engineers. Applicants do not need to submit GRE or GMAT scores. Prefered applicants have a bachelor’s degree in civil engineering from an ABET-accredited institution and a minimum 3.0 GPA. Most online civil engineering master's degree programs serve working professionals who hold an undergraduate degree in engineering. Graduate students learn advanced civil engineering concepts, take a core of required courses, and usually choose a technical concentration, like transportation, structural, or environmental engineering. Details may vary depending on the school and program chosen. Students pursuing an online master's degree in civil engineering take core, elective, and concentration courses, which may differ by school and program, but most programs have a common core requirement. Below is a list of courses you can expect to encounter in an online master's in engineering program. Traffic Engineering: This course examines how engineers can improve the design of transportation systems to better serve the people who use them. Students learn how to minimize congestion and reduce accidents through better engineering. Issues explored include the design and control of intersections, intelligent transportation systems, urban freeways, and intercity networks. This class prepares learners to work as traffic or transportation system engineers. Water Treatment Process: This class covers the systems that are used for treating municipal drinking water. Topics covered include filtration, biological treatment, disinfection, and sludge processing. Also discussed are wastewater treatment options, both engineered and natural. Students who take this course will learn skills useful for an engineer working in water resource management. Green Building Materials: Students in this course receive an overview of the design and construction of sustainable buildings. Topics covered include leadership in energy and environmental design (LEED) standards, sustainability evaluation methods, and how to reduce the ecological footprint of construction projects. Students who take this course will have the skills needed for a variety of civil engineering positions related to construction and sustainability issues. How Long Does it Take to get an Online Master's in Civil Engineering? A variety of factors can affect the length of a master's degree in civil engineering online program, which can take between 18 months and six years to earn. Issues that affect course length include number of credits needed to graduate, whether you attend part-time or full-time, whether you enroll every term, number of transfer credits, and if there are any residency requirements. Another factor that can impact how long it takes to earn your civil engineering master's online is if the program uses individually-paced or cohort learning. Individually-paced programs allow students to complete courses at their own pace. Cohort learning requires students to start and end the program with a group of peers, whom take the same set curriculum. Cohort programs tend to be less flexible and require more time to complete. On average, it takes about 30 credits and two years of full-time study to graduate from an online master's in civil engineering program. Attending an accredited school for your online master's in civil engineering is very important. Accreditation is a voluntary process that colleges and universities undergo to demonstrate that they are qualified to educate students and grant degrees. A school can be regionally or nationally accredited. Regional accreditation is more popular and generally more trusted than national accreditation. Non-profit schools tend to have regional accreditation while for-profit schools usually obtain national accreditation. Most schools will accept transfer credit from regionally-accredited schools, but regionally-accredited schools generally do not accept credit from nationally-accredited institutions. 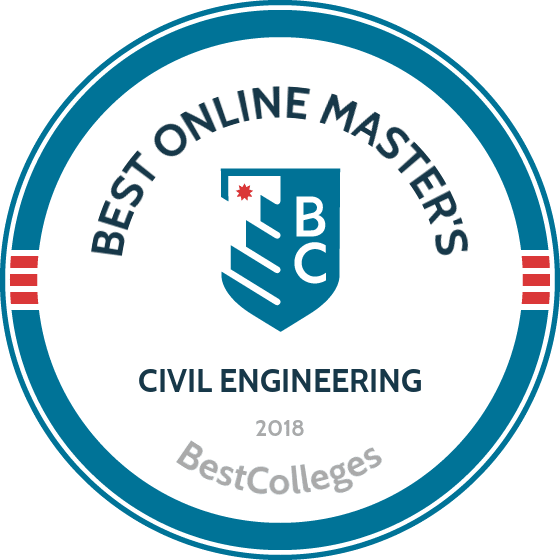 When looking for a master's in civil engineering online program, it is best to find a regionally accredited college or university. The U.S. Department of Education (ED) provides an updated list of regional accrediting agencies. The ED establishes policies related to federal financial aid for education and coordinates and monitors how that aid is distributed. The Council for Higher Education Accreditation (CHEA) coordinates the accreditation process for colleges and universities in the U.S. The CHEA ensures that accrediting agencies maintain a level of quality. You can find a list of accredited schools on the ED's website. Master's degree in civil engineering online programs generally prepare graduates to work in a related field. Depending on your concentration or specialization, you may qualify for other types of engineering positions. Civil engineering tends to attract people who are interested in solving a variety of social problems through better design. Below, is a list of common careers that graduates pursue. Civil engineers design, build, supervise, and maintain construction projects like airports, roads, buildings, bridges, water systems, tunnels, dams, and more. They usually specialize in one of the following areas: construction, geotechnical, structural, or transportation. Civil engineers typically need a graduate degree and licensure to qualify for senior positions. Environmental engineers create solutions to environmental problems using engineering principles. They help improve public health by addressing issues like air and water pollution and waste disposal. Environmental engineers usually need at least a bachelor's degree in engineering. Graduates with advanced degrees and practical experience garner higher salaries and are more competitive job candidates. Civil engineering technicians assist civil engineers with planning and designing public and private infrastructure projects like bridges, highways, dams, airports, and water treatment systems. Civil engineering technicians usually need to have at least an associate degree. Those holding a master's degree in civil engineering are much more competitive job candidates. Construction managers plan, supervise, coordinate, and budget construction projects. They commonly spend time at the construction site; they usually have an office as well. Large companies expect construction managers to have a bachelor's degree at minimum. Candidates with a master's degree and experience in construction management would likely be given preference. Architectural and engineering managers coordinate, plan, and supervise projects and activities at architectural and engineering firms. Most of this work takes place in offices. They may supervise staff, make plans, and develop budgets. A bachelor's degree or higher is usually required to be hired as an architectural or engineering manager. Earning a master's degree in civil engineering provides graduates with an advantage in terms of salary compared to those with a bachelor's degree or less. The table below includes salary information for civil engineering-related careers at the entry-, mid-, and late-career levels for those holding a master's degree. Median salaries for graduates with a bachelor's degree in each career tend to be substantially lower. Paying for your online master's in civil engineering can seem overwhelming. Numerous federal funding opportunities exist to help you pay for your degree, including scholarships, loans, grants, and work-study programs. Make sure to fill out a Federal Application For Student Aid (FAFSA) form so that you'll know which types of aid you qualify for. The private sector offers a wide variety of scholarships for civil engineering students, even at the graduate level. Make sure to check for funding opportunities through the American Society for Civil Engineers.